Insider Tip: Let's talk Japanese etiquette - don't talk on the phone on trains - never walk on Japanese-style tatami mat floors with shoes or even slippers - wait for the initial kanpai toast - do slurp when eating noodles, no matter what your parents taught you - don't tip - at all - EVER! Boldly modern, Tokyo, the Japanese capital is a fast-moving, trendy, and busy city, yet ferously attached to its traditions. Shinto and Buddhist temples are beautifully preserved. Traditional lodging named Ryokans are valorised by locals and tourists alike. Many historical and quaint areas such as Yanaka, the neighborhood of the cats, still remain authentic. Don’t be surprised to come across a woman wearing a beautiful, hand-crafted kimono in the street or on the metro. Be ready to be Lost in Translation in Tokyo! Even if the Tokyoites are very friendly – omotenashi, the art of welcome being a supreme value in Japan – many only speak Japanese. If you don’t master the kanjis (Japanese characters), eating or finding you way in the eclectic Edo, might be tricky. Yes, Tokyo is a crazy town and she is waiting for you. Late March to April is Sakura, the cherry blossom season, the best and the most popular time to visit Japan. June tends to be wet, while high temperatures and powerful storms can strike throughout July and August. Autumn months are cooler and aesthetically beautiful with the fall colors. Winters are cold and dry. Tokyo has two airports: Narita Airport (NRT) handles the majority of international flights and only a small number of domestic flights. It is just 60 kilometers outside of central Tokyo. The more centrally located Haneda Airport (HND) handles a smaller number of international flights and the majority of domestic flights. Tokyo is covered by a dense network of train, subway, and bus lines, which are operated by about a dozen different companies. The train lines operated by JR East and the subway lines are most convenient for moving around central Tokyo. Get a Suica or Pasmo pass, valid for train, metro and bus. Most shinkansen lines, the fast train, connect major Japanese cities with Tokyo. Manga, karaoke, super fresh fish, zen gardens, and gorgeous temples – your days will be filled with wonder, surprise, fun, culture, and history. Wander around the Yoyogi Park and its giant forest, planted with 120,000 trees, right in the heart of the city. In the vast alley leading to the largest Shinto temple of Japan, Meiji-Jingu, stop to admire the impressive wall of sake-barrels. Make sure to wash your hands and mouth in the chozusha before entering the sanctuary. 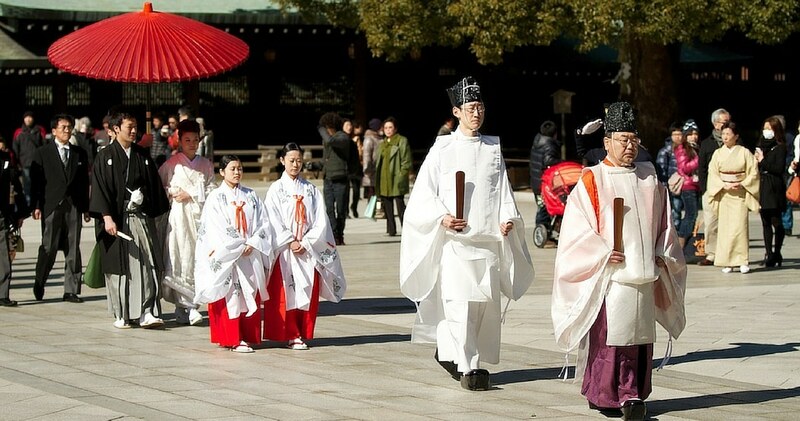 If you come on Saturday morning, you might see a Shinto wedding, a life-time experience! Another important temple is Senso-ji in Asakusa, with its majestuous Thunder Gate, the beautiful five-storied pagoda and the incredibly large incense cauldron. Skip the shopping street between the gate and the temple itself and explore the backstreets instead to find traditional Japanese products, for example wind chimes, washi paper, zori sandals or tabi socks. Off the beaten path, the lovely Gotokuji Temple is home of Maneki Neko, the lucky cat and one the japanese culture icons. During Sakura, Shinjuku Gyoen National Garden near the busiest train station Shinjuku is famous for its cherry trees. Get up to the 45th floor of the Tokyo Metropolitan Government Building for an amazing view of Edo. It’s free of charge and with no waiting line! Ueno park in the district of Taito is also a popular place to admire the cherry blossoms. 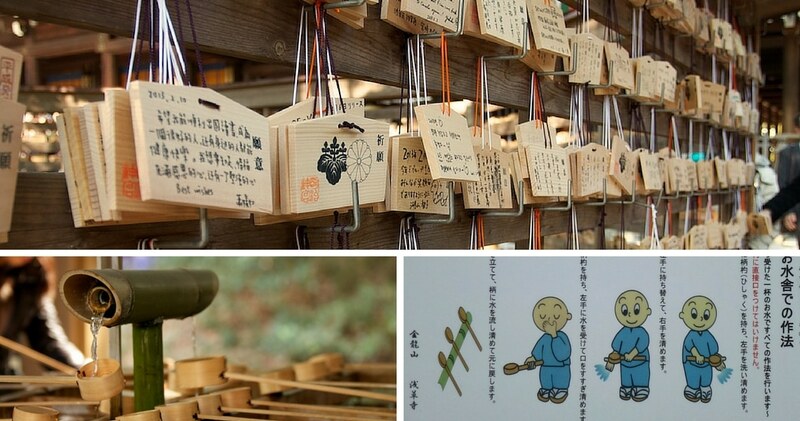 Step back into history at the Toshogu Shrine or feed the birds near the Shinobazu Pond. 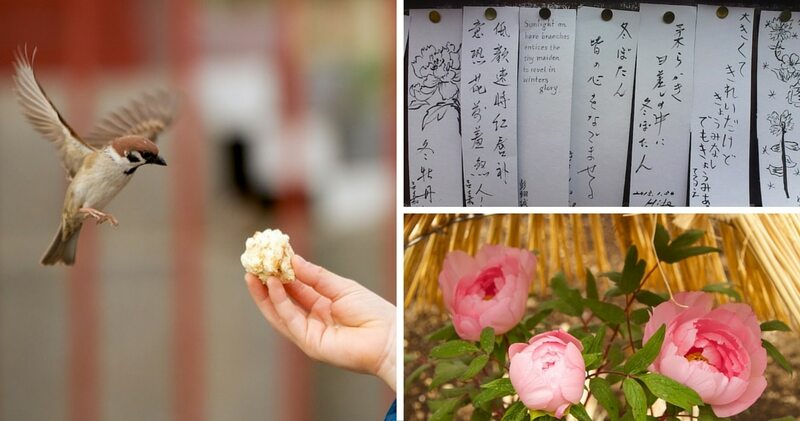 Don’t miss the lovely peony garden, so elegant under their straw-umbrellas. Many museums like the MOMAT or the National Museum can be found on its grounds, as well as the Ueno Zoo. Of course, strolling the Imperial East Gardens and taking a peek at the Imperial Palace are a must-do. Admire Mont Fuji and the Imperial Palace from the top of the 634 meters of the Tokyo Skytree, one of the highest towers in the world. Magical at dusk to catch the sunset and admire the city lights. Not far from it is the Zojo-ji Temple. Next to it is a very special Buddhist cemetery with many Jizo Statues. 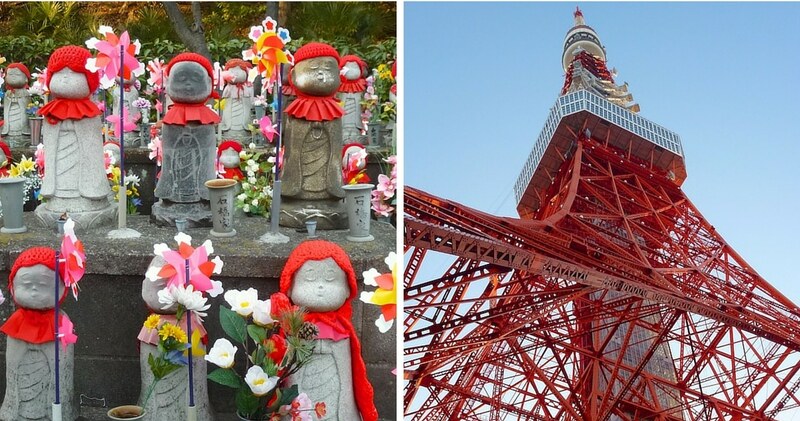 These statues represent the unborn children of Japan. The parents pick a statue and can dress it up with clothes and toys. The art and architecture lovers will certainly prefer the Mori Tower with its 360° view of the city, and just below the incredible Mori Art Museum guarded by the giant arachnide sculpture from Louise Bourgeois in Roppongi Hills. Another architectural hot spot is the Asahi Beer Hall, adorned by Philippe Starck with a work of art nicknamed “the Golden Poo” by the residents. Adopt the manga attitude in Akihabara, the Electric Town district. Harajuku and Aoyama neighborhoods are great for shopping and wandering, especially the pedestrian street Takeshita-dori and Omote-sando, a more stylish boulevard. Totoro and Princess Mononoke fans should head to the Ghibli Museum and find themselves transported into the mind of the japanese animation master, Hayao Miyazaki himself. Make sure to reserve your tickets months in advance! Don’t hesitate to push your way through the crowd at the famous Shibuya crossing also know as “The Scramble” just across the Shibuya station on the Ginza line. Every weekend, the farmer’s market in front of the United Nation University in Aoyama is the best place to buy fabulous local and bio food or have a bite at one of the food trucks along with the Japanese foodies. Don’t miss the world’s largest fish market in Tsukiji. The auction sale of toro, the fat tuna, takes place in the very early morning but the market is busy until the evening. Wear waterproof shoes and take your pictures on the sly! Many small restaurants serve extra fresh sushi in the alleys around the market. You can also find some Japanese spices and traditional tableware in the local shops. Once in the area head to the Namiyoke Temple, dedicated to protecting the fishermen, for a prayer or wish. To experience the ancestral art of Chanoyu, the tea ceremony, head to the Imperial Hotel in chiyoda-ku (1-1-1, Uchisaiwaicho, Chiyoda-ku). Another spot is the Tea Pavilion in the Happo-en gardens by the lake (1-1-1, Shirokane-dai, Meguro station, JR Yamanote Line). For some amazing sushi, delicious sashimi and maki, served with fine sake, without paying the high price, Sumeshiya is your place (2-6-6 Suido, Bunkyo 112-0005). At Mrs. Nanao‘s restaurant, you won’t pay a fortune to enjoy delicate and delightful kaiseki, a sort of Japanese mezze or a succession of seasonal and fine small dishes (1-5-1_, Azabujuban, Minato-ku). 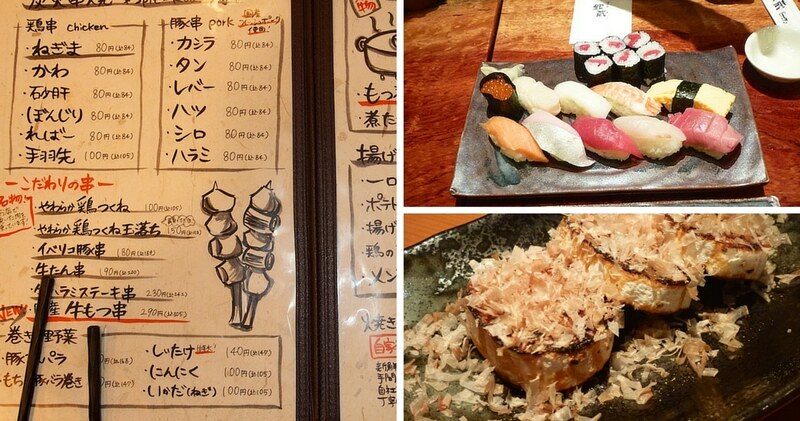 Asakusa, the old Edo neighborhood, is a paradise for foodies. Around Nakamise-dori, you will find the best senbei or rice crackers. They are cooked in front of you and wrapped into nori seaweed. To taste some kintsuba, red bean jelly cubes in a fine pastry wrap, head to the ancestral patisserie, Tokutaro (3-36-2 Asakusa, Taito-ku). In Ginza, wander into the side alleys filled with typical small restaurants. If you want to try robot (grill encased in the table), go to Robata Honten (1-3-8 yurakucho, Chiyoda-ku). The Japanese garden of the Chinzanso Hotel is in itself an attraction. The rooms are elegant and the hotel offers a spa and many activities (2-10-8 Sekiguchi, Bunkyo-ku). For a more traditional stay, the Edo Sakura is a Japanese guesthouse or ryokan. Nestled in Shitaya, one metro stop from Ueno Park, this is the perfect place for a unique and memorable experience (3-2-13, Shitaya, Taito-ku). Just a stroll away from the fine dining in Ginza, this vertiginious five star hotel is located in the center of the futurist neighborhood of Shiodome, with its glass towers and suspended gardens. Some of the Park Hotel rooms have been decorated by local artists. For the single malt scotch afficionados, the best high-rise whisky bar in Tokyo is just on the 25th floor (1-6-3 Higashi-shimbashi, Shimbashi station, Ginza line). A brief five-minute train ride from Shibuya, this suburban bargain hotel has English-speaking staff, clean rooms, and a healthy breakfast. The B Sangenjaya is your best budget chain in Tokyo (2-17-9 Taishido, Setagaya-ku). Here are additional options for where to stay in Tokyo. Here are a few sites and blogs that will help you organize your trip. Go Tokyo is the official city travel guide. It will help you find accommodation, restaurants, transportation, and so forth. Another helpful site is the Japan National Tourism Organization. This blog will leave you craving for more! Food Sake Tokyo is a chef’s guide to the best food in Tokyo. What else! Another lovely blog, Celia In Tokyo, written by an Australian girl living in Tokyo, will provide you with lots of insider tips, illustrated with amazing pictures. The online Tokyo Guide from the Lonely Planet is, as always, a useful and inspirational source. Last Updated On: August 11th 2016. 15 Responses to "Tokyo, Japan"
rhoooooo ! I love your article… Beautiful pictures (especially emas from Meiji-Jingu Temple… I have a same one ;-)) Japan is definitively a perfect travel destination for food, culture, and people… Tokyo, like other Japanese cities I have visited, is very inspiring and… breathable. Depending on their location on the archipel, lifestyle, pace and surrounding could be different but there is always the same sweetness and of course… a lot of energy! Thank you Anne for your comment full of positive vibe! Japan is such an incredible country and Tokyo such an impressive city! Happy you liked the article! Japan has always been on our list, specifically during the cherry blossom season, and when friends return, the tales never cease to amaze me! I love that the culture is strong on etiquette, and I wish more countries followed suit. Fantastic photos capturing such a beautiful destination! Thank you Amy. Japan is truly a country you fall in love with. I surely did and can’t wait to discover more of it. I hope you can see it one day. What an awesome guide! I love Tokyo and this guide is very helpful 🙂 Great pictures too! Thank you Eric. So happy you enjoyed it. My husband and I took so many pictures, it was hard to choose some that could best represent the beauty and energy of Tokyo. Thank you Sheena. I am happy my article gave you some new insights that you can explore on your next visit. I feel I still have so much to see and learn and I will definitely check out your food guide article on Tokyo!!! You are so right Maya. It seems this city never sleeps! I found the Japanese very respectful. I think if you pay attention to how they behave you should be ok. Thank you Sumti. I am happy you find this guide useful and hope you will be able to use it soon!